Those loveable Finnish monsters of rock, Lordi, are back with a new album, 'Deadache.' Their adventures into horror and theatre rock continues with a fine batch of melodic rock and metal songs that will keep you singing along with your toe tapping. Not quite as dark, but nearly as campy as Alice Cooper (in his younger days), certainly more metal than White Zombie, and definitely more talented than GWAR, Lordi has progressed into a band that knows how to craft a catchy melodic hard rock/metal composition. But, how they perform with those outrageous outfits, I'll never know. What makes 'Deadache' a better album than previous works is Lordi strongly pursuing the melodic hard rock/metal motif with greater skill and enthusiasm. Several things stand out: more vibrant and catchy riffs, the keyboards compliment rather than lead (most times), and the guitar solos are more prevalent, passionate and creative. Additionally, though the content is the usual Lordi horror show stuff, the lyrics are more coherent working well in the compositions while being less cheese and more sophisticated camp. All these aspects work well in songs like 'Girls Go Chopping' and 'Man Skin Boots.' Both songs really rock and have some amazing guitar work. For monster pleasing melodic metal look no farther than 'Bite It Like A Bulldog' (also the first video of 'Deadache'); or for a monster ballad check out the creepy 'Monsters Keep Me Company.' Additional crypt pleasers include the driving rocker 'Raise Hell In Heaven' and the smooth melodic rock of 'Hate At First Sight.' At least one song should have stayed in the grave, namely, 'The Ghosts Of The Heceta Head,' but it really doesn't diminish the album significantly. 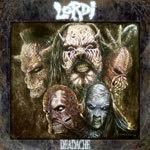 Lordi's 'Deadache' is a solid work: consistent, well performed and immensely entertaining. Some may find the whole monster or horror show rock corny, campy or even ridiculous. Yet, I had a lot of fun listening to Lordi; they make me smile and not take this whole music business too seriously. Very recommended. Lordi's 'Deadache' is a solid work: consistent, well performed and immensely entertaining. Some may find the whole monster or horror show rock corny, campy or even ridiculous. Yet, I had a lot of fun listening to Lordi; they make me smile and not take this whole music business too seriously.